For Narendra Modi, going into elections next year, the focus has been to put across India as a major global economy. The recently concluded 10th BRICS summit has taken place at an important conjuncture in history. Donald Trump has just shaken the Atlantic alliance that has been the pivot of its global hegemony. It has happened at a time when the American President, defying his administration, is reaching out to President Vladimir Putin of Russia. More important, the deepening US-China trade conflict is now morphing to an all-out war by the US to foil China’s attempts to become a major industrial power through its “Made in China 2025” strategy. The Johannesburg Declaration of the BRICS was along the standard lines. China may have wanted a stronger statement against the US, but it is currently keeping its head low. India would have liked to build on the BRICS Xiamen declaration where Pakistani outfits like Jaish-e-Muhammad and Lashkar-e-Tayyeba were named in the joint declaration. But this time they were not, though the statement itself is quite strong against terrorism. The BRICS have extended support to the Joint Comprehensive Plan of Action (JCPOA) to deal with the Iran nuclear issue and in that sense backed Iran, over the US which has walked out of the deal. Likewise, it has reiterated the importance of the global trading order with WTO as its cornerstone. Over the years, the importance of BRICS as a representative of the leading emerging economies has only grown. In 2014, in a signal of its seriousness in promoting the emerging country development agenda, the BRICS created the New Development or BRICS Bank patterned on the development banks like the World Bank and the Asian Development Bank. In 2015, they created the BRICS Contingent Reserve Arrangement which is patterned on the International Monetary Fund. There is no intention of challenging the World Bank, ADB or IMF, but the BRICS has signaled that it is not entirely satisfied with the way these American and Japanese dominated bodies function and is thus supplementing them. In that sense, there is no intention to give the call for a new world order; merely an effort to extract the best terms from the existing one. India has been pressing for the setting up of a BRICS rating agency for some time because it believes that the methodologies of the existing western ones are flawed. An expert group report on the issue submitted a report to the BRICS Business Council which, in turn, commended the issue to the BRICS Summit in its annual report. In the current situation, the imperative for states like India is to be able to take advantage of the opportunities that open up and ensure that it does not become collateral casualty in the clash between big powers. Strengthening the network of tier-2 powers through BRICS is an important step in anchoring its foreign policy. In his remarks in the closed-door meeting of the leaders, Modi reaffirmed India’s commitment to multilateralism, international trade and a rule-based world. He also strongly pressed member-nations to move along what is called the Fourth Industrial Revolution (4IR) and called for an exchange of best practices in the area. He said that the future would see a radical change in industrial production which would require high skills, but provide temporary employment. New Delhi has taken bilateral steps as well to shore up its position. It has reached out to China in Wuhan and tamped down the needless tension that it had itself provoked in the years leading up to the Doklam crisis. It has also taken care to repair its fraying ties with Russia through the Sochi summit and its firm commitment not to be bullied by the Americans into breaking its time-tested arms transfer ties with Moscow. It is also making sure to keep its ties with the US on an even keel, as indicated by the coming ‘2+2’ talks scheduled in September. 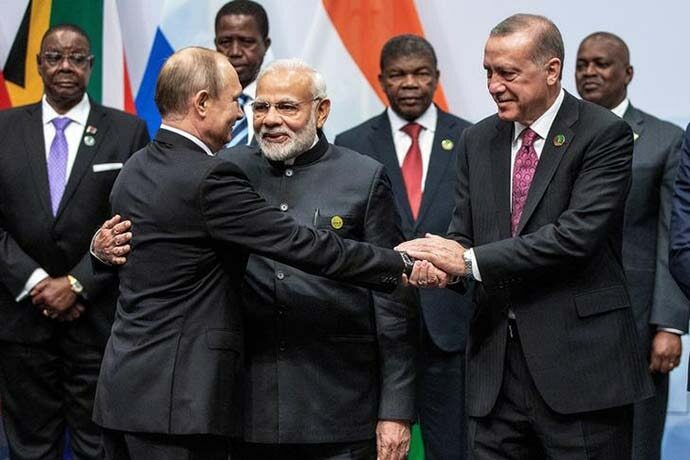 For this reason, an important aspect of the Johannesburg summit were the bilateral meetings Modi had, especially the one with Chinese leader Xi Jinping and Russian Prime Minister Vladimir Putin. For Prime Minister Modi, going into elections next year, the focus has been to put across India as a major global economy which believes in win-win outcomes in the geopolitical conflict that is taking place between the US, China and Russia. 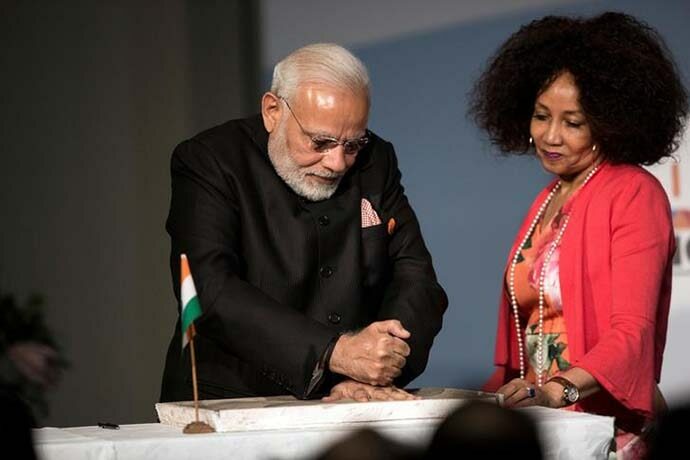 Modi’s participation at the summit in Johannesburg has taken place in the context of the theme of the summit which relates to Africa. Both India and China are wooing African nations and while Modi’s tour has taken him to Uganda and Rwanda, Xi Jinping visited Senegal, Rwanda, and Mauritius as well. China is Africa’s biggest trading partner and is making an additional push to enhance its relations.